A notice published online in Mandarin by the country's economic planning agency added "virtual currency mining activities [including] the production process of Bitcoin" to a list of industries that could be shut down. The complexity of the tasks is adjusted to ensure each block of transactions is processed on a regular basis - approximately once every 10 minutes on average. As a consequence, the more computers that compete, the harder the puzzles are made, which in turn means a greater amount of electricity is required to power them. 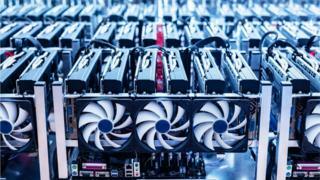 Some of the world's biggest cryptocurrency mining operations - known as farms - are based in China. Concerns about them have previously been raised in the country's state-controlled media. Last year, one of the country's regulators - the Leading Group of Internet Financial Risks Remediation - called on local governments to direct mining companies to make an "orderly exit" from the market. The National Development and Reform Commission's intervention appears to have had little effect on the value of Bitcoin. Its notice was published on Monday, since when one bitcoin has continued to trade for above $5,000 (£3,820) - its highest level since November 2018.